MEYER, Hans. Die Barundi. Eine volkerkundliche Studie aus Deutsch-Ostafrika. Mit 1 farbigen Karte, 32 Lichtdrucktafeln, 23 Tafeln in Ubung und 19 Textbildern. Koniglich Sächsische Forschungsinstitut in Leipzig Institut für Volkerkunde Erste Reihe: Ethnographie und Ethnologie, Erster Band. 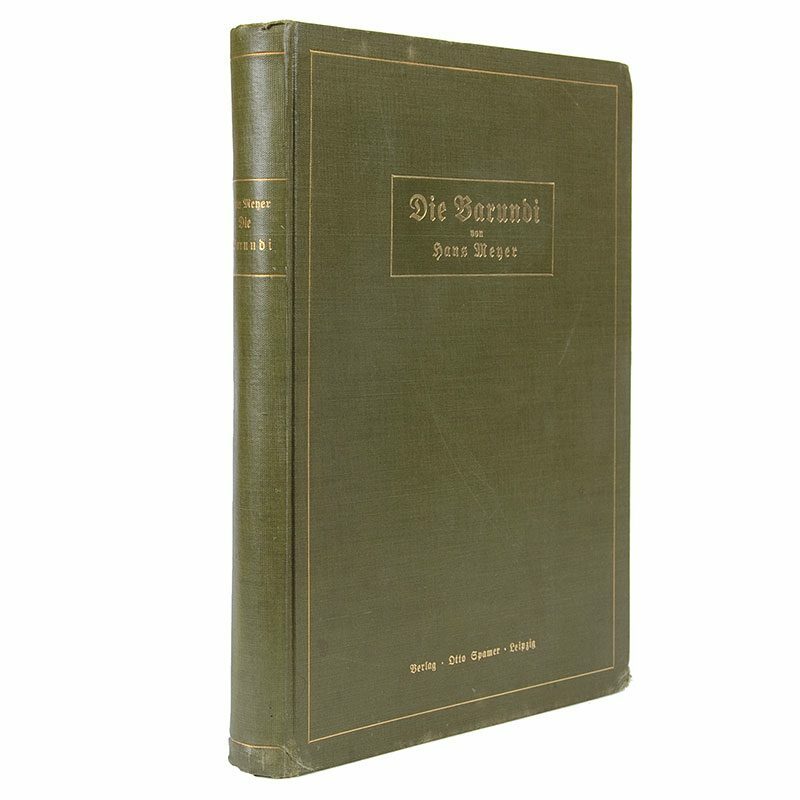 Leipzig: Verlag von Otto Spamer, 1916 4to. xiv,205pp. 32 collotype plates and 23 half-tone plates, 18 text-illustrations and 2 maps in text, coloured folding map, biblio., index. Hans Heinrich Josef Meyer (1858 – 1929) was a German geographer and ethnographer who was the first European to climb to the summit of Mount Kilimanjaro. He undertook research in German East Africa and in 1915 became director of the Institute for Colonial Geography. The Winterton copy with his bookplate, spine slightly bumped at tail, a very nice copy in the publisher’s olive green cloth. The half-tone plates show many examples of artefacts.